Do you remember our 'What are these mystery objects' query in last months magazine (January 1998)? Click here if you didn't see this article. 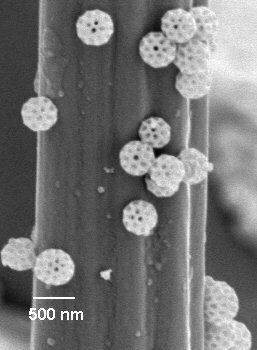 Essentially they were tiny structured objects only 0.5 micron across (500 nanometers) found on the hairs of fly's leg (shown right). The originator of the query, Frank Placido (UK), hadn't found a satisfactory answer and sought the help of Micscape and our readers. The image has been on our site all month and has attracted some interesting emails (thanks to those who responded). However, if anything, the responders were as mystified as we were, and we were beginning to think we couldn't supply an answer for this month's issue, February 1998. But an email from Mike Dingley in Australia, a regular Micscape contributor, has set us on what we believe is the right track to solving the mystery. He said he thought they were brochosomes which apparently are insoluble solid objects found in the excreta of leafhoppers (a common group of insects in the family Homoptera). Frank also remarked in his original query that a colleague had mentioned the objects were something that sounded like this term. I did a quick web search for 'brochosome' and found a web site with an image of brochosomes that look almost identical in shape and similar in size (estimated from the web image displayed) to Frank's mystery objects. We have become intrigued with these brochosomes, as they raise even more questions. e.g. We have a few leads already on some of these queries, and we are hoping to put together an article on the information we find. We will acknowledge all material submitted and the copyright does of course remain yours. One final thought, some amateur microscopists with the finest optics on their microscope like pushing their light microscopes to the limit. This is often achieved by resolving the fine features on the silica frustules of diatoms. The brochosomes are typically 0.5 micron across (possibly larger) but not far from the limit of resolution with a light microscope with green light (ca. 0.22 micron). Is it possible to find, recognise and photograph brochosomes on leafhoppers using a light microscope? If the size range of brochosomes extends to say 1 micron, the surface features would be of the order of 0.25 microns apart, right at the limit of resolution. But if the contrast is there, is their just a chance of resolving some detail e.g. with a deep blue filter? Let us know your thoughts on this, even better have a try and see if you succeed! See the following month's Micscape article for a fuller explanation of brochosomes. Many thanks to Frank Placido, of the University of Paisley, Scotland for first submitting the query and image. This was a fascinating query and has sparked an equally fascinating follow-up on what are very intriguing objects. Also thanks to Mike Dingley and his colleagues in Australia for finally pinning down what the mystery objects are most likely to be.